On Monday, July, 16, 2012, a void was created, as the world lost a very special person; one who touched many lives during his stay here. At the same moment, the heavens rejoiced, in a grand reunion, as Dr. Stephen R. Covey returned to the Father, where I am certain he heard these words: “…Well done, thou good and faithful servant: thou hast been faithful over a few things, I will make thee ruler over many things: enter thou into the joy of thy lord” (Matthew 25:21 [KJV]). I believe Stephen’s faith, and understanding of eternal principles are what made him so successful and why he is loved by so many people. Stephen had a firm testimony, which is echoed in the following quote: “We are not human beings on a spiritual journey. We are spiritual beings on a human journey” (Covey, n.d.). The realization that life is eternal, (only our earthly existence is short); that we existed in spiritual form, prior to gaining a human form, AND, that we will once again return to our spiritual form, as we await the resurrection, when we will once again receive a physical body. But this time, we will receive a glorified, exalted body; this is the very essence of “beginning with the end in mind”. What we (you and I) do (requires action), for others, while in our human state, determines our spiritual progression. We often find ourselves “immersed in the thick of thin things. In other words, too often we spend most of our time taking care of the things which do not really matter much at all in the grand scheme of things, neglecting those more important causes” (Monson, 2009). 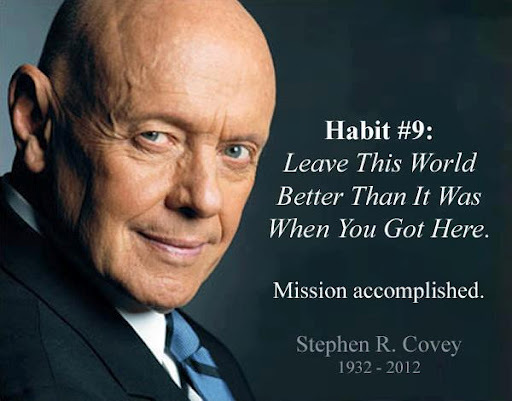 Dr. Stephen R. Covey was there. He left a legacy. He will be remembered for his accomplishments through the countless lives he has touched. It is my desire to also leave a legacy through touching the lives of those whom God puts in my path as I grow spiritually, during my human journey. I pray that touching others’ lives is your desire as well, and I welcome your comments and thoughts on this posting. Covey, S. R., Merrill, A. R., & Merrill, R. R. (1994). First things first. New York, NY: Free Press. Monson, T. S. (2009, November). What have I done for someone today? Ensign. Thompson, W. L. (n.d.). Have I done any good? Hymns. 223. This entry was posted in Education, Leadership and tagged 2bfree4life, Business, caring, Change, Education, Emotional Contagion, Emotional Intelligence, Faith, Follower, Followership, greatness, lead, Leader, Leadership, Leading, Life-long Learning, Management, moral compass, Othermindedness, Relationship, Ripple Effect, Servant Leader, social connectedness, thought leaders, trust, Values. Bookmark the permalink. A great tribute for a great man! We would all do well to follow his example and learn from his teachings!